Welcome to Bed and Breakfast Canziane, welcome home! Our Bed and Breakfast is near Treviso, in quiet position. Rooms are renewed, wide and with all comforts: TV, internet broadband (on cable and wireless), frigobar, air-conditioning, private bathroom. At your wakenig you will find a large breakfast. 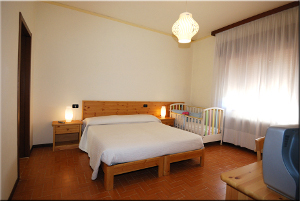 B&B Canziane is menaged by Anna e Gino who will be happy to help you for all information that you need. From our B&B Canziane you can easily reach a lot of touristic destination like Venice, Treviso, Asolo, Conegliano and Oderzo. You can also go on a journey to discover the amazing network of Veneto Villas, situated between lakes and the Venice lagoon, crossing over the great plain right up to the Alps.